There have been some weird controllers made for video games over the years. Namco’s NeGcon was one of the strangest, but it was awesome. It’s been a long time since Ridge Racer was a definitive franchise, but it used to be that a new Ridge Racer was a platform-defining moment. The series was no stranger to experimentation, either, perhaps best evidenced by the NeGcon, a bizarre-looking peripheral made specifically Ridge Racer. When we think “racing controllers,” what usually crops up are wheels, gas pedals, and the other mechanisms found in real cars. Though PlayStation was home to wheels, too, NegCon was different. What made the NeGcon so appealing was its precision. In the early, pre-analog stick days of the PlayStation, you were limited to tapping a d-pad in order to navigate your car. This meant you were constantly under or overcompensating turns. 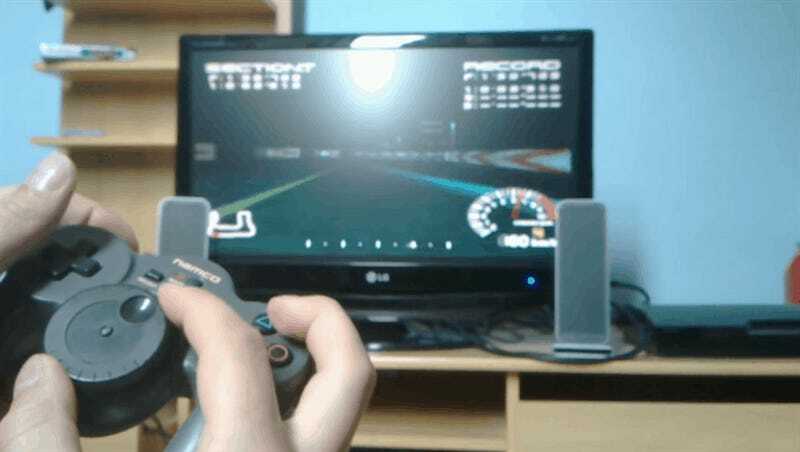 It wasn’t a very good way to play a racing game! For people who wanted to get serious about racing games, the NeGcon was an early godsend; at the time, people swore by this controller. The NeGcon proved so popular that other games, even non-racing games, started to support it. (Ace Combat!) Sony even acknowledged it, and included compatibility with Gran Turismo. The NeGcon managed to survive into the PlayStation 2 era, as well, though compatibility got spotty as the years went on. Both Ridge Racer V and Wipeout Fusion worked, however. According to an extensive review on Racket Boy, the last game to support the NegCon was apparently a collection of PS1 games for the PS2 in 2005. With the release of Ridge Racer Type-4 in 1998, Namco released a riff on the NeGcon called the JogCon, which featured a unique wheel in the center. No other games ended up supporting the JogCon. That Actually Happened is a weekly series at Kotaku in which we highlight interesting moments in gaming history. So far, we’ve revisited when Sonic kissed a human, a live game show on Xbox 360, and Sony throwing a God of War party with a dead goat. If you have any suggestions for future entries, please let us know in the comments below!